Beginning in the early 1990s, scientific knowledge of the environmental limits of microbial life on Earth expanded dramatically as microbiologists applied new methods of molecular biology over a broad range of environmental extremes. Microbial species are now known to occupy a vast range of environments that previously were unimagined. New discoveries have revolutionized scientific understanding of Earth's biosphere, opened up new views of the history of terrestrial (land-based) life, and increased the possibilities that life could develop elsewhere in the cosmos. The name applied to this new research area of biology is extremophiles research. Extremophiles (literally "extreme-loving") are defined as organisms that occupy environments judged by human standards as harsh. These encompass both physical and chemical extremes. 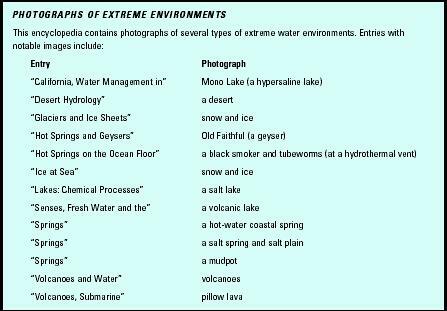 Examples of water environments characterized as extreme are summarized in the accompanying table. 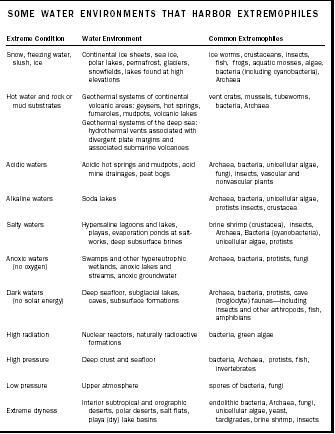 Different classes of extremophiles have been defined based on the nature of the environments where they are found. For example, extremophiles that have adapted to high temperatures are called thermophiles. Those that require cold temperatures for growth and reproduction are called psychrophiles (as opposed to other organisms that can tolerate occasional cold temperatures and are not considered extremophiles). Those that love acidic environmentse., with low pH ) are called acidophiles, whereas those found in highly alkaline conditions (high pH) are alkaliphiles. Organisms that live under high pressure are called piezophiles, and those found in high-radiation environments are as yet unnamed. Some organisms occupy more than one environmental extreme simultaneously, and are known as polyextremophiles. An example is the archaebacterial species, Sulfolobus acidocalderius , which thrives in boiling mudpots at temperatures exceeding 80°C (176°F) and at acidities less than pH 3. Although mostly microbial, extremophiles include a few species of multicellular organisms such as worms, amphibians, mollusks, and crustaceans. beneath the Antarctic ice sheet. In salt-water environments, water can remain liquid below 0°C (32°F) because dissolved salts lower its freezing point. Some psychrophilic species, such as those found in brine films , are known to be active down to −15°C (5°F). Some complex multicellular organisms, like the wood frog, can tolerate the freezing of up to 65 percent of their body water during winter hibernation. Pressure, which is measured relative to atmospheric pressure at sea level (where 1 bar roughly equals 14.5 pounds per square inch), increases with depth in the oceans. In the ocean, this hydrostatic pressure goes up at the rate of approximately 1 bar per 100 meters. Measured within the crust, lithospheric pressure increases at a rate almost twice hydrostatic. Live microorganisms obtained from the Mariana Trench, the deepest place in the oceans (10.9 kilometers, or 6.8 miles), have been successfully grown under surface conditions, whereas others have been shown to be obligate piezophiles that grow only at high pressure. 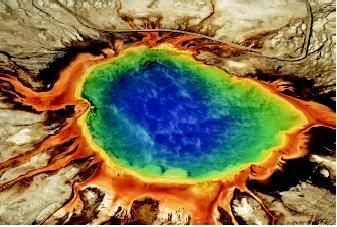 The gradations of color at Yellowstone National Park's Grand Prismatic Spring are caused by different types of algae and other microbes. As the hot spring water leaves the ground, it cools as it moves outward (downslope), creating different temperature zones, with the cooler zones located farther from the spring outlet. Each microbial species (or strain) is adapted to a very specific temperature zone, as is evident by the color patterns caused by their presence. Pressure decreases with increasing altitude, such that at 10 kilometers (6.2 miles) above the Earth's surface, the pressure is only about one-fourth that at sea level. Organisms have been discovered growing on the top of Mount Everest, the highest point on the Earth's surface (more than 8.8 kilometers [5.4 miles]). Viable spores of bacteria and fungae have even been collected from the lower stratosphere. Radiation is energy that travels as either particles (e.g., highenergy neutrons, protons, electrons, or ions) or waves (e.g., X-rays, gamma rays, or ultraviolet rays). The bacterium Deinococcus radiodurens , which has been found growing on the fuel rods of nuclear reactors, is a famous example of an extremophile that can tolerate high levels of radiation. Chemical extremes in the environment include pH, which ranges from values of less than 0 (extremely acidic) to more than 14 (extremely alkaline or basic). In nature, microorganisms have been shown to occupy nearly the entire range of pH. Some species of bacteria have been found living in a acid mine drainage at a pH of approximately 0.5. Others live in soda lakes, such as those found in the western United States and Egypt, where the highly alkaline waters can reach a pH of 11. Life also occupies an equally broad range of salinity. Salt-loving halophiles live in salt plains, evaporation ponds at saltworks, and natural salt lakes (e.g., the Dead Sea, Israel and the Great Salt Lake, Utah). Halophiles also live within hypersaline brines that exist around deep-sea vents and in deep subsurface rock formations. In nature, salinities can range from fresh water, with very low salinity, to super-saturated brines. At very high concentrations, salt precipitates , often entrapping microorganisms. The ability to survive desiccation (extreme drying) has been demonstrated for both vegetative cells and reproductive spores of many microbial species. In the driest deserts on Earth, microbial species (so-called "endoliths") often survive by living inside porous rocks where they are protected from ultraviolet radiation. The coldest desert environments on Earth are found in the dry valleys of Antarctica. These polar deserts harbor many types of endolithic communities dominated by cyanobacteria, algae, and fungi. Antarctic endoliths live just a few millimeters beneath rock surfaces in limestones or in translucent, quartz-rich sandstones. Decades may pass with no rain, but when it comes, these organisms spring to life, using the available light, water, and nutrients to quickly grow and reproduce before drying out and again becoming dormant (inactive). Even though photosynthesis accounts for more than 99 percent of the energy that powers the biosphere, thermal and chemical energy sources within the Earth can provide forms of energy capable of supporting complex ecosystems . Consequently, extremophiles can also be found in aphotic (non-light) environments, such as deep in the ocean or in the Earth's subsurface. 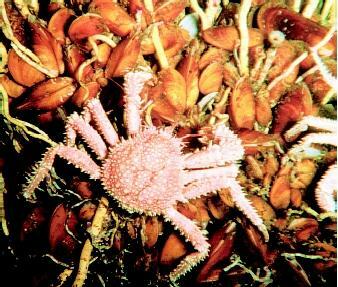 Crabs, mussels, and tubeworms are multicellular organisms found in hydrothermal vent environments on the seafloor. These organisms and a host of microbes are specially adapted for this unusual ecosystem, which is based on chemosynthesis rather than photosynthesis. on photosynthetically-derived organic matter that washes down from the surface, but many so-called lithoautotrophic species (which literally means "self-feeding from rocks") use simple byproducts of chemical weathering of rocks to extract energy from the environment. For example, oxidation reactions associated with the weathering of basalts in an oxygen-free environment may lead to the release of hydrogen. The hydrogen released is used by methanogens to produce methane and energy. Although some scientists have questioned the evidence for hydrogenbased microbial ecosystems in deep basalt formations, the possibility of an active microbial community at great depths could have implications for subsurface storage of highly radioactive materials and other wastes. Microbial interactions could act to weaken containers, leading to leakage and the undesirable spreading of waste materials. Methanogens are microbes that live in anoxic (non-oxygen) environments, which can include some swamps, rice paddies, or certain highly enriched lakes, ponds, or streams, and their sediments. Methanogens combine carbon dioxide (CO 2 ) and hydrogen (H 2 ) to produce organic matter, while releasing methane gas as a byproduct. Wetlands and rice paddies (agricultural wetlands) account for half the total methane produced globally. Methane is a greenhouse gas , and its rate of increase in the atmosphere is exceeding that of CO 2 . Human activity has played a major role in this methane increase. The ability of some extremophiles to survive harsh conditions similar to those found on other planets has raised the possibility that life might exist beyond Earth. As an example of this survival ability, halophiles have been cultivated from inclusions of brine contained in salt crystals deposited hundreds of millions of years ago. Microbes also have been isolated from Siberian permafrost, where they have remained in deep freeze for more than 3 million years. Equally impressive are bacteria germinated from spores preserved in Dominican amber dated at more than 30 million years old. Given the propensity for prolonged survival in these types of environments, could an extraterrestrial biota someday be discovered within brines, salts, or ices on another planet, like Mars or a moon like Europa? Cellular enzymes extracted from extremophiles have spawned a multibillion dollar biotechnology industry. The enzymes are used in industrial and medical applications, ranging from the production of stone-washed jeans, to creating artificial sweeteners, to genetic fingerprinting. One thermophile that lives in hot springs is the source of the heat-stable deoxyribonucleic acid (DNA) polymerase enzyme used in polymerase chain reaction (PCR). PCR forms part of the foundation of much of the biotechnology industry. Proteins produced by psychrophilic organisms may one day prove useful in coldfood preparation and in detergents for washing in cold water. SEE ALSO Acid Mine Drainage ; Astrobiology: Water and the Potential for Extraterrestrial Life ; Brines, Natural ; Desert Hydrology ; Earth's Interior, Water in the ; Ecology, Fresh-Water ; Ecology; Marine ; Fresh Water, Physics and Chemistry of ; Geothermal Energy ; Hot Springs and Geysers ; Hot Springs on the Ocean Floor ; Ice at Sea ; Life in Water ; Mars, Water on ; Microbes in Groundwater ; Microbes in Lakes and Streams ; Microbes in the Ocean ; Mineral Resources from Fresh Water ; Mineral Resources from the Ocean ; Plankton ; Radioactive Chemicals ; Sea Water, Physics and Chemistry of ; Solar System, Water in the ; Springs ; Volcanoes and Water ; Volcanoes, Submarine . Anderson, R. T., and Chapelle, F. H. "Evidence against Hydrogen-Based Microbial Ecosystems in Basalt Aquifers." Science 281 (1998):976–977. Chyba, C., and K. Hand. "Life without Photosynthesis." Science 292 (2001): 2026–2027. Frederickson, J. K., and T. C. Onstott. "Microbes Deep Inside the Earth." Scientific American 275, no. 4 (1996):42–47. Horikoshi, K., and W. D. Grant. Extremophiles: Microbial Life in Extreme Environments. New York: Wiley-Liss, 1998. Lemonick, M. D. Other Worlds: the Search for Life in the Universe. New York: Simon and Schuster, 1998. Madigan, M. T., and B. L. Marrs. "Extremophiles." Scientific American 276, no. 4 (1997):82–87. Pace, N. R. "A Molecular View of Microbial Diversity and the Biosphere." Science 276 (1997):734–740. Rothschild, Lynn J., and Rocco L. Mancinelli. "Life in Extreme Environments." Nature 409 (2001):1092–1101. Stevens, T. O., and J. P. McKinley. "Lithoautotrophic Microbial Ecosystems in Deep Basalt Aquifers." Science 270 (1996):450–454. Snow algae were noted first by Aristotle (384–322 B.C.E. ). Although simple microbial communities can be associated with snowfields in either alpine or polar regions, the most common species in snow generally are single-celled green algae (chlorophytes). The most obvious sign of these algae is the pink watermelon-colored snow associated with the psychrophilic Chlamydamonas nivialis, a green alga that can acquire a strong reddish color produced by high levels of carotenoids (yellow, orange, or red pigments). These pigments are produced to protect the algal cells from ultraviolet irradiance, which is extremely high at the snow surface, largely because of snow's reflective properties. I was actually looking for the environment and how the sea, lakes and oceans affect the Earth.